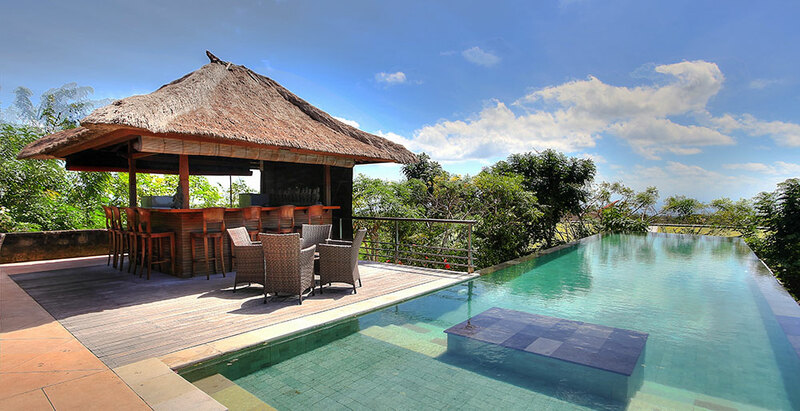 Villa Indah Manis in Uluwatu Pecatu on Bali's Bukit Peninsula commands breathtaking views of the ocean and, on a clear day, the volcanoes of East Java. This beautiful area boasts some of the most idyllic white-sand coves on the island, and some of its best surf beaches. Designed to maximise the views and catch the breezes, this fully staffed, five-bedroomed villa comprises a series of pavilions and a dramatic 16-metre pool complemented by lawns, terraces and water features. Modern Balinese architecture showcases local materials, such as Palimanan stone, teakwood and ironwood roof shingles. Indah Manis is as suitable for intimate family holidays as it is for unforgettable wedding parties.